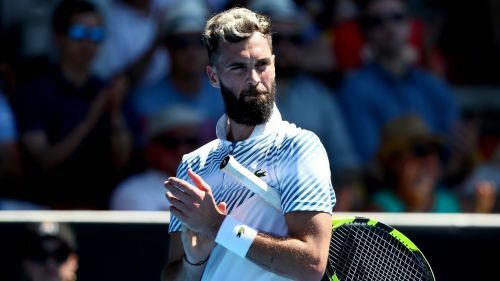 Benoit Paire eased to a straight-sets win over Pablo Andujar in the final of the Grand Prix Hassan II on Sunday as the Spaniard failed to defend the title he won 12 months ago. Andujar defeated Kyle Edmund in last year's decider – his third success in Marrakech after previous triumphs in 2011 and 2012 – but he was soundly beaten 6-2 6-3 on this occasion. Paire broke three times en route to a straightforward victory as the Frenchman picked up the second ATP Tour crown of his career. In doing so, Paire extended his perfect record over his opponent to 4-0 and gained revenge for a defeat to Andujar on the ATP Challenger Tour two weeks ago, when the Spaniard saved a match point to claim the title in Marbella. Only one place in the rankings separated these two at the start of play but once the action got under way Paire was firmly in the ascendancy, a deft drop-shot setting up a break point before Andujar's wild forehand gave his rival a 4-2 lead in the first. The set was sealed courtesy of another break as the Spaniard dumped a backhand into the tramlines. At 3-2 up in the second, Paire's thumping return forced Andujar to net and victory was sealed with consummate ease as an ace out wide set up match point before another superb serve allowed him a routine forehand winner into the open court.